August 23, 2017 (Taichung, Taiwan) – Minister of Agriculture of Saint Kitts and Nevis, Honorable Eugene Hamilton, and Minister of Agriculture of the Nevis Island Administration, Mr. Alexis Jeffers, had the opportunity on August 22, 2017, to visit Taiwan’s Agriculture Research Institute in Taichung, Taiwan, during an official visit to that country. The delegation, led by the Minister of Foreign Affairs, the Honorable Mark Brantley, met with Dr. Junne-Jih Chen, Director of the Institute who provided valuable information about the use of technology in the agricultural sector. Saint Kitts and Nevis has benefited from the use of this technology through a Taiwanese project of soil mapping and whose findings were presented to the delegation by the specialist who visited the Federation. The results of the soil mapping project are important, she acknowledged, because they give valuable information on the chemical make-up of the soil and provide information to the government and farmers on the types of crops that are best suited to a specific land area. The results stemming from the project will be forwarded to the agricultural ministries for review, analysis and necessary action. Members of the delegation also visited green houses and learned of the new technologies incorporated in new design styles of green houses that are functional and specifically constructed to shield crops from inclement weather. 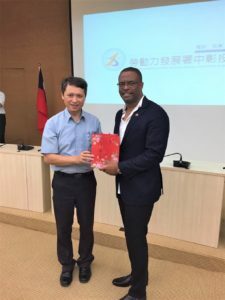 Minister Brantley and the delegation also toured one of Taiwan’s Workforce Development Agencies and learned from its director about the possibilities offered to the unemployed in Taiwan desirous of learning a new skill. The director also informed the delegation that through the ICDF, the agency has been able to assist countries with vocational training for their citizens. The very large facility housed areas for learning skills such as carpentry, mechanics, plumbing, and baking among others, and provides employment and entrepreneurship services as well. The Foreign Minister noted the thrust of St Kitts and Nevis into greater vocational training and certification and welcomed the opportunity and offer of partnership with Taiwan in the ongoing efforts to ensure training for all Kittitians and Nevisians.